The Intel HD 520 is a graphics processor you can find integrated in the 6th Generation Intel Core U-series “Skylake” CPUs, such as the popular Core i5-6200U and i7-6500U. 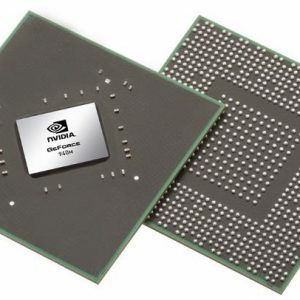 These chips are typically used in the mainstream notebooks, ultraportables, and select lower-end gaming laptops. 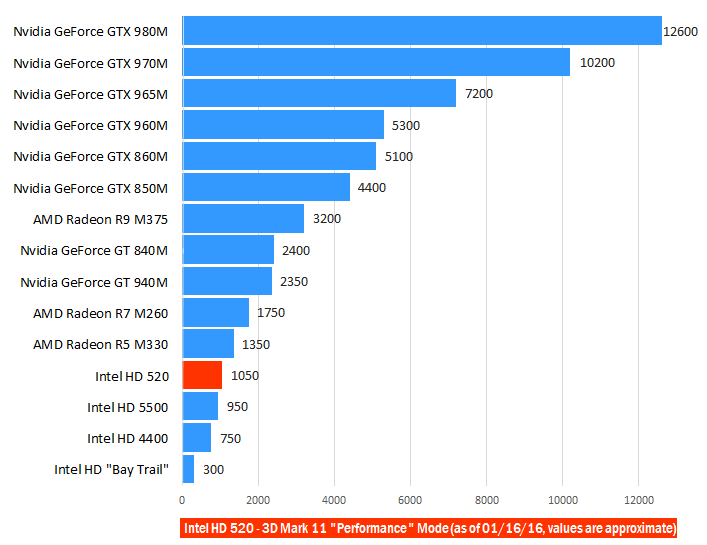 The GPU brings a slight performance improvement over the previous generation Intel HD 5500, primarily thanks to a bit higher clock speeds of 1,000 or 1050 MHz (depending on CPU model) instead of 900 MHz, as well as doubled number or ROP and TMU units. What’s not visible in graphics rendering benchmarks, such as 3D Mark 11 below, is improved support for 4K content decoding, resulting in lower CPU use when you play these high-resolution videos. As expected, 4K, Full HD, and lower resolution videos run perfectly smooth on the Intel HD 520. For this review, we used an HP Pavilion 15 15.6-inch Full HD laptop with the mid-range Intel Core i5-6200U processor with the Intel HD 520 graphics, 8GB of dual-channel system memory (2 x 4GB modules), and a standard 5,400rpm mechanical hard drive with 1TB capacity. The tested machine had Windows 10 Home operating system and Intel HD 10.18.15.4281 drivers installed. Keep in mind that laptops with single channel memory setups, with one RAM module instead of two or more, won’t have as good integrated graphics performance as the dual-channel ones. Also, different processor models like the i3, i5 and i7, different thermal designs of laptops’ chassis, as well as BIOS settings, can influence performance of the Intel HD 520 and other integrated graphics processors. Gameplays were recorded with help of a specialized capture card on another computer instead of using software recorders which can degrade system performance. The world’s most popular MMORPG League of Legends on maximal graphics detail settings and 1080p 1920×1080 resolution runs flawlessly, with around 50 frames per second. If you primarily play this hardware non-demanding game, the HD 520 IGP is an almost equally good choice as some high-end dedicated video card. DOTA 2 is another famous MMORPG title. It requires better hardware resources than LoL and you won’t be able to play it on maximal settings and Full HD with the Intel HD 520. Instead an optimal choice appears to be 720p HD-class resolutions like 1280×720 and lower-mid detail settings. Frame rates in this case are around 45. If you increase settings to higher-medium, fps will drop to around 35 mark. The Intel HD 520 can render PC game classic Minecraft effortlessly on the highest settings. Frame rates were somewhere between 60 and 70 fps most of the time. Counter Strike: Global Offensive – the most played first person shooter game, isn’t a graphics-rich title. On the positive side, it doesn’t require gaming-class hardware. 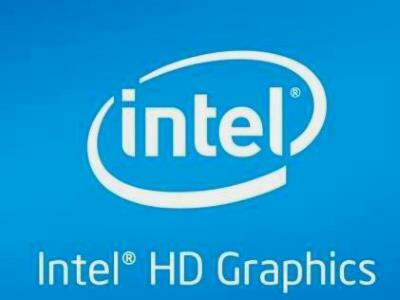 On the Intel HD 520 graphics, you can play it on 720p resolution and high settings, with around 65 fps most of the time. The latest iteration of Grand Theft Auto – GTA 5, isn’t so integrated graphics-friendly as the CS:GO. One can say the game is barely playable on the reviewed GPU. With all settings set to minimum and 720p resolution, frame rates vary between 20 and 25 fps. Battlefield 4 works quite smooth, if you’re willing to make a compromise and dial down resolution to 720p and put settings on medium. However, there was a glitch with displaying ground textures, which we weren’t able to fix by changing graphics settings or reinstalling graphics drivers and the game. A similar story is with Call of Duty: Advanced Warfare. Frame rates varied greatly, depending on scene, but generally they were mostly between 30 and 50 fps on minimal settings and 720p resolution. Unfortunately, a serious graphics rendering glitch on a part of the first level was very annoying, as you can see in the first part of the video. Again, we weren’t able to fix it. Elder Scrolls V: Skyrim runs very well on low / 720p settings, with mostly 50 – 60 fps. FIFA 2016 is easily playable, but the settings need to be put on minimum to achieve gameplay without stutter. During standard camera shots of the matches, frame rates are around 55 fps, while during zoomed in scenes like goal celebrations, when the objects are bigger, they drop to around 30 fps. For a list of laptops with the Intel HD 520 click here. Will it support ddr4 ram ? As i have a dell inspiron 15 3567 and it had a 4gb ddr3 ram which i’ll be replacing by 8gb ddr4. Do you think that the HD 520 can handle gunbound sesson 4? spesifikasi intel memang Lebih baik / FungsioanaL. Hey I was playing Full HD movie, but it’s blur, it’s like the pixel gone crack,why is that? 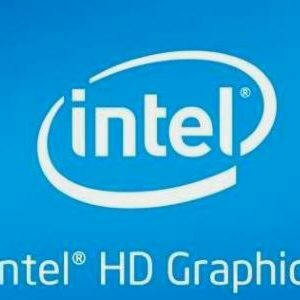 Is the intel HD 520 graphics card enough for working with 3D software programs..?? BS.. 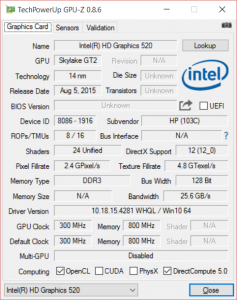 I run a i5-6200U with the Intel HD 520 card on DOTA 2 with full graphics and 1920-1080 res. No problems what so ever… If you want screenshot, then I would be very pleased to contribute. Do you think that the HD 520 will handle the latest world of warcraft legion? Would you be able to run an oculus rift on a laptop with these exact specifications?? Definitely not. The rift requires far, far more GPU power. Laptops that can run a rift today are huge beasts with full-sized discrete GPUs and battery life best measured in minutes. Will this graphics card be sufficient for small amounts of solidworks use? I know that things like zebra stripes won’t run perfectly…I have a dedicated PC but need a light, portable laptop for travel which can handle Adobe, solidworks and renderings software such as keyshot. Yes, it does. It doesn’t have its own memory. may i know how unrealengine4 fps works in intel hd 520 and also the comparison of intel hd 520 vs nvidia 930m??? I am researching laptop computers and your thorough review helped me understand the specs of the 520 chip. As the first reviewer said the performance of such a tiny integrated chip is impressive. Thanks for the review!